We’d love your help. Let us know what’s wrong with this preview of Lumberjanes #3 by Noelle Stevenson. To ask other readers questions about Lumberjanes #3, please sign up. Is this issue any good??? Tessa C They are all so cute and interesting. Lo suficientemente gracioso e inteligente para ser aceptable. Está bueno, amiguitos. Deberían leerlo. 7.- Ripley (¿Por qué hasta el final? Porque la niña me desagrada muchísimo). "I... guess the important thing is you're safe now... but if you EVER MAKE ME THINK YOU'RE DEAD AGAIN... I WILL FIND YOU AND MAKE YOU ACTUALLY DEAD." I cannot help myself from binge reading these at the moment; they are great little pick me up! I also know I shouldn't be giving everyone of them 4/5 stars - but they deserve nothing less!! Poor Jen (their cabin scout leader); Lord only knows how the woman copes. Ripley is hilarious as ever. I cannot wait to see the adventures continue!! These characters are more than meets the eye! You really shouldn't read the book by the cover. And I love Jen's love for the girls. Ghost stories, tween Lesbian picnic "dates," and dinosaurs. How can you go wrong? Just read these already. This series is seriously so cute! I love how all the girls work together to solve things! Ladies helping ladies! What the Junk! This series keeps getting more and more irresistible. Didn't really dig the little spooky stories or the artwork this volume, but Mal and Molly are precious little gems. Damn do I wish this kind of age-appropriate representation existed when I was growing up. Would have made my feelings a LOT less confusing. I'm having just so much fun reading these. I like that all of the Lumberjanes are different. They all have a different look, different skills and so on. Plus, I love that they solve everything together and one of their slogans was literally "Yay! Math and science and logic!" or something like that. It's just great. An amazing graphic novel series about a gang of five best friends at camp having adventures and solving problems with brains and teamwork. I love how there's a wide range of body shapes and a queer perspective. It makes me want to go back to girl guides and get my 'friendship to the max' badge. Fans of Adventure Time will love this series. More Lumberjanes please! I'm a Lumberjane and I'm okay! I travel through interdimensional portals with bear witches all day! I have a live raccoon on my head and badges in "everything under the sun" and being "up all night!" Oh I'm a Lumberjane and my comics rock! Girls wander off farther and farther away from the camp, but aren't scared and don't need saving! Combining their mental and physical strength, they work their way through an Indiana Jones-like labyrinth. And there's also a tiny bit of romance. I would love a Riley chapter. Just a little one shot of like an hour of her life. The adventures only get more and more exciting in every issue. This one was definitely the most thrilling so far, and it still managed to pack in some hilarity along the way! 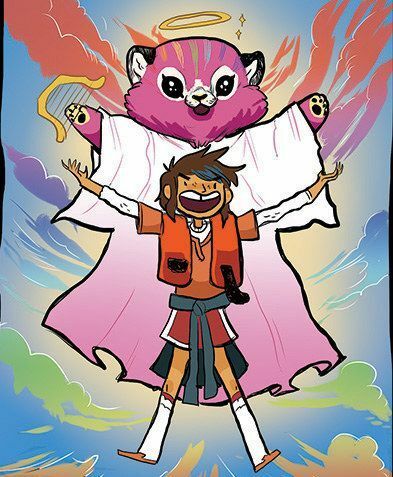 This must be the cutest graphic novel I have ever read so far!! The characters are amazing, too! I love how they work together to solve everything before them. Another great issue! This series has felt very cinematic to me so far, which I like. And it's amazing how attached I am to the characters already. Enjoyed this slightly less than the last, but I still really like this comic. The tone is just so wonderful. "Fighting monsters is the easy part. Back home is where the really scary stuff is." Blijft leuk, zie mezelf alleen niet al de (40?) overige delen kopen wanneer mijn Scribd abonnement over is. Wat ik jammer vind want het zijn wel echt leuke graphic novels. 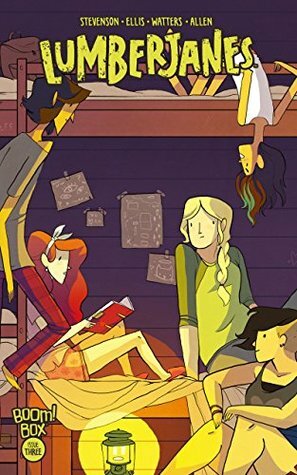 A fun graphic novel about a bunch of girls at Lumberjanes camp (like Scouts or Guides) learning about life, friendship and the supernatural things in the forest! Give me more....!!! This series continues to provide fun attics of girls who face fears and challenges while at camp. Friendship is key to their survival as they work together to overcome personal and monster challenges. A história deste número já faz mais sentido para mim. Foca-se apenas numa situação que é como sair daquela caverna. Já não é tão confusa a história. Fez-me lembrar muito o Indiana Jones e a Lara Croft.